Franklin preparing to perform at the White House in 2015. 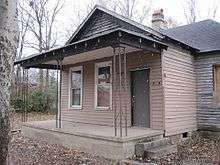 Aretha Louise Franklin was born in Memphis, Tennessee, the daughter of Barbara (née Siggers) and Clarence LaVaughn Franklin. Her father, who went by the nickname, "C. L.", was an itinerant preacher originally from Shelby, Mississippi, while her mother was an accomplished piano player and vocalist. Alongside Franklin, her parents had three other children while both C. L. and Barbara had children from outside their marriage. The family relocated to Buffalo, New York when Franklin was two. Before her fifth birthday, C. L. Franklin permanently relocated the family to Detroit, Michigan where he took over the pastorship of New Bethel Baptist Church (Detroit, Michigan). Franklin's parents had a troubled marriage due to stories of C. L. Franklin's philandering and in 1948, they separated, with Barbara relocating back to Buffalo with her son, Vaughn, from a previous relationship. Franklin's debut Atlantic album, I Never Loved a Man the Way I Love You, also became commercially successful, later going gold. Franklin scored two more top ten singles in 1967 including "Baby I Love You" and "(You Make Me Feel Like A) Natural Woman". Franklin's rapport with producer Jerry Wexler helped in the creation of the majority of Franklin's peak recordings with Atlantic. In 1968, she issued the top-selling albums, Lady Soul and Aretha Now, which included some of Franklin's most popular hit singles including "Chain of Fools", "Ain't No Way", "Think" and "I Say a Little Prayer". 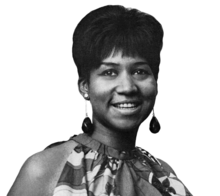 In February 1968, Franklin earned the first two of her Grammys including the debut category for Best Female R&B Vocal Performance. On February 16, 1968, Franklin was honored with a day in her honor and was greeted by longtime friend Martin Luther King, Jr. who gave her the SCLC Drum Beat Award for Musicians just two months before his death. In June 1968, she appeared on the cover of Time magazine. Franklin's success expanded during the early 1970s in which she recorded top ten singles such as "Spanish Harlem", "Rock Steady" and "Day Dreaming" as well as the acclaimed albums, Spirit in the Dark, Young, Gifted & Black and her gospel album, Amazing Grace, which sold over two million copies. In 1971, Franklin became the first R&B performer to headline Fillmore West, later recording the live album, Aretha Live at Fillmore West. Franklin's career began to experience problems while recording the album, Hey Now Hey (The Other Side of the Sky), which featured production from Quincy Jones. Despite the success of the single, "Angel", the album bombed upon its release in 1973. Franklin continued having R&B success with songs such as "Until You Come Back to Me" and "I'm in Love" but by 1975, her albums and songs were no longer top sellers. After Jerry Wexler left Atlantic for Warner Bros. Records in 1976, Franklin worked on the soundtrack to the film, "Sparkle", with Curtis Mayfield. The album yielded Franklin's final top 40 hit of the decade, "Something He Can Feel", which also peaked at number-one on the R&B chart. Franklin's follow-up albums for Atlantic including Sweet Passion, Almighty Fire and La Diva bombed on the charts and in 1979, Franklin opted to leave the company. After being raised in Detroit, Franklin relocated to New York City in the 1960s, where she lived until moving to Los Angeles in the mid-1970s. She eventually settled in Encino, Los Angeles where she lived until 1982. She then returned to the Detroit suburb of Bloomfield Hills, Michigan to be close to her ailing father and siblings. Franklin maintains a residence there to this day. Following an incident in 1984, she has cited a fear of flying that has prevented her from traveling overseas; she has performed only in North America since then. The mother of four sons, Franklin gave birth to her first son, Clarence, shortly after she turned 14. Her first two sons' fathers have never been identified. While Franklin was pursuing her career and "hanging out with [friends]", Franklin's grandmother Rachel and sister Erma took turns raising the children. Franklin's third child, Ted White, Jr., was born in 1964 and is known professionally as Teddy Richards. He has provided guitar backing for his mother's band during live concerts. Some of her music business friends have included Dionne Warwick, Mavis Staples, and Cissy Houston, who began singing with Franklin as members of the Sweet Inspirations. Cissy sang background on Franklin's classic hit "Ain't No Way". Franklin first met Cissy's daughter, Whitney, in the early 1970s. She was made Whitney's honorary aunt, and Whitney often referred to her as "Auntie Ree". Whitney died on February 11, 2012. Franklin stated she was surprised by her death. She had initially planned to perform at Houston's memorial service on February 18, but her representative claimed that Franklin suffered a leg spasm and was unable to attend. In response to criticism of her non-attendance, she stated, "God knows I wanted to be there, but I couldn't." In 2010, Franklin canceled a number of concerts after she decided to have surgery for an undisclosed tumor. Discussing the surgery in 2011, she quoted her doctor as saying it would "add 15 to 20 years" to her life. She denied that the ailment had anything to do with pancreatic cancer, as it was rumored. On May 19, 2011 Aretha Franklin had her comeback show in the Chicago theatre. In May 2013, Franklin canceled two performances to deal with an undisclosed medical treatment. Later in the same month, Franklin canceled three more concerts in June and planned to return to perform in July. However, a July 27 show in Clarkston, Michigan was canceled due to continued medical treatment. In addition, Franklin canceled an appearance at an MLB luncheon in Chicago honoring her commitment to civil rights on an August 24 date. She also canceled a September 21 performance in Atlanta due to her health recovery. During a phone interview with The Associated Press in late August, 2013 Franklin stated that she had a "miraculous" recovery from her undisclosed illness but had to cancel shows and appearances until she was at 100% health, stating she was "85% healed". Franklin has since returned to live performing, including a 2013 Christmas concert at Detroit's Motor City Casino. She launched a multi-city tour beginning the summer of 2014, starting with a June 14 performance in New York at the Radio City Music Hall. Franklin wipes a tear after being honored with the Presidential Medal of Freedom on November 9, 2005, at the White House. Seated with her are fellow recipients Robert Conquest, left, and Alan Greenspan. ↑ "That's Dr. Aretha Franklin to you". Call and Post. 2011-11-02. Archived from the original on May 21, 2013. ↑ "Aretha Franklin inducted into Gospel Music Hall of Fame | Music | Detroit Free Press | freep.com". ↑ "100 Greatest Singers: Aretha Franklin". Rolling Stone. November 27, 2008. Retrieved May 16, 2013. ↑ "100 Greatest Artists of All Time". Rolling Stone. Retrieved May 16, 2013. ↑ "Sister Ree's Scrapbook, An Aretha Franklin Photo Gallery 13". Retrieved November 6, 2010. ↑ Bego 2010, p. 11. ↑ McAvoy 2002, pp. 19-20. 1 2 McAvoy 2002, p. 22. ↑ McAvoy 2002, pp. 20-21. ↑ Dobkin 2006, p. 48. ↑ Feiler 2009, p. 248. ↑ "Inez Andrews: A towering gospel artist - Chicago Tribune". Articles.chicagotribune.com. 2012-12-19. Retrieved 2014-03-20. ↑ Hevesi, Dennis (December 21, 2012). "Inez Andrews, Gospel Singer, Dies at 83". The New York Times. Retrieved 2014-03-20. ↑ Dave Hoekstra (12 May 2011). "Aretha Franklin's roots of soul". Chicago Sun-Times. Retrieved 18 April 2012. ↑ Carroll, Jillian (2004). Aretha Franklin. Chicago: Raintree. ISBN 0-7398-7029-7. ↑ Ebony 1964, p. 88. 1 2 3 4 Gilliland, John (1969). "Show 52 – The Soul Reformation: Phase three, soul music at the summit. [Part 8] : UNT Digital Library" (audio). Pop Chronicles. Digital.library.unt.edu. 1 2 Ebony 1964, p. 85. ↑ Natalie Cole broke Franklin's "Best Female R&B Vocal Performance" winning streak with her 1975 single "This Will Be (An Everlasting Love)" (which, ironically, was originally offered to Franklin). ↑ Dobkin 2006, p. 5. ↑ Whitaker 2011, p. 315. ↑ Bego 2010, p. 107. ↑ "TIME Magazine Cover: Aretha Franklin". Time. June 28, 1968. Retrieved September 30, 2011. ↑ "Aretha Franklin songs". Archived from the original on January 20, 2012. – from the Bill Graham archives; requires free login. ↑ Holden, Stephen (Oct 11, 1981). "Aretha Franklin: Gospel and Glamour". New York Times. New York Times. Retrieved 17 Feb 2015. ↑ Rolling Stone magazine, "Aretha Franklin's New Wave of Pop" by Eliza Graham, page 11. ↑ Patrick Goldstein (18 July 1986). "Writer's Ballad Tapped For Abc-tv Fall Theme". South Florida Sun-Sentinel. Retrieved 18 April 2012. ↑ Rosenthal, Lauren (May 24, 2010). "Univ. confers 3,243 degrees at 309th Commencement". Yale Daily News. Archived from the original on September 25, 2012. Retrieved November 30, 2010. ↑ "Q&A: Aretha Franklin talks about Gospelfest and new album". The Washington Post. May 10, 2013. Retrieved May 17, 2013. ↑ "Aretha Franklin Gets Standing Ovation from Letterman Audience With Knockout Performance". Showbiz411. September 30, 2014. Retrieved September 30, 2014. ↑ "Aretha Franklin becomes first woman to join R&B chart's 100 club". Express.co.uk. Retrieved October 18, 2014. ↑ Miller, Matt (December 30, 2015). "Aretha Franklin Just Brought the Leader of the Free World to Tears". Esquire. Retrieved 31 December 2015. ↑ Greer, Carlos (December 9, 2015). "Aretha Franklin stuns at Kennedy Center Honors". Page Six. Retrieved 31 December 2015. ↑ Hattenstone, Simon (December 30, 2015). "Obama cries as Aretha Franklin proves why she's the queen of soul". the Guardian. Retrieved 31 December 2015. ↑ Kreps, Daniel (December 30, 2015). "Watch Aretha Franklin Bring Obama to Tears at Kennedy Center Honors". Rolling Stone. Retrieved 31 December 2015. 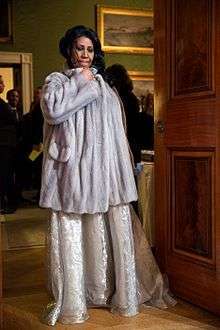 ↑ "Aretha Franklin Dropping Her Fur Coat at 'Kennedy Center Honors' is Ultimate Life Goals!". ↑ Dobkin 2006, p. 8. ↑ Whitaker 2011, p. 312. ↑ McMahon 2000, p. 373. ↑ Nick Salvatore (2005). Singing in a Strange Land: C.L. Franklin, the Black Church, and the Transformation of America. Little Brown. pp. 203–204, 224. ISBN 0-316-16037-7. OCLC 56104283. ↑ Ebony 1995, p. 32. ↑ "Aretha Franklin gets engaged". NDTV. January 3, 2012. Archived from the original on July 9, 2012. Retrieved 18 April 2012. ↑ Bego 2010, pp. 125-126. ↑ "Soul singer Aretha Franklin is engaged". CNN. January 2, 2012. ↑ "Aretha Franklin to get married this summer | Celebrity Buzz | a Chron.com blog". Blog.chron.com. 2012-01-02. Retrieved 2012-05-13. ↑ Roger Friedman (17 February 2012). "Who Is Cissy Houston? A Primer". Showbiz411. Retrieved 18 April 2012. ↑ Whitall, Susan. "Aretha Franklin recalls meeting a young Whitney Houston". Aretha Franklin, who will sing at Whitney Houston's funeral Saturday, spoke to Al Roker on the "Today" show Friday morning about the first time she met Houston, as a wide-eyed 8- or 9-year-old. The Detroit News. Retrieved 18 February 2012. ↑ Whitall, Susan. "Aretha Franklin recalls meeting a young Whitney Houston". The Queen of Soul corrected one thing about her relationship to Houston. She says she wasn't really Houston's godmother, but a sort of honorary aunt. The Detroit News. Retrieved 18 February 2012. 1 2 "Singer Whitney Houston dies at 48 - CNN.com". CNN. February 12, 2012. ↑ "Aretha Franklin Talks Turning 70 Years Old , Shares Update On Her Health". Access Hollywood. ↑ On an ABC promo aired on July 27, 2010, announcing Franklin and Condoleezza Rice's appearing together in concert there was a segment in which Franklin was being interviewed and she said herself, "I am a Democrat". ↑ Ireland, Corydon; Pazzanese, Christina; Powell, Alvin; Walsh, Colleen (May 29, 2014). "Eight to receive honorary degrees". Harvard Gazette. Retrieved May 29, 2014. ↑ Bego 2010, pp. 162-165. 1 2 "Aretha Franklin Reveals Tumour Scare". Contact News. 10 January 2012. Retrieved May 26, 2013. ↑ Bego 2010, p. 305. ↑ Ebony 1995, p. 30. ↑ Jet 2003, pp. 62-63. ↑ "Aretha Franklin Sets The Record Straight On Her Health". Access Hollywood. January 13, 2011. ↑ Bob Gendron (2011-05-20). "Aretha Franklin sings in Chicago - Chicago Tribune". Articles.chicagotribune.com. Retrieved 2014-03-20. ↑ Lewis, Randy (May 13, 2013). "Aretha Franklin cancels 2 shows for undisclosed ailment". Los Angeles Times. Retrieved May 17, 2013. ↑ "Aretha Franklin taking June off, postponing shows". USA Today. May 22, 2013. Retrieved May 23, 2013. ↑ "Aretha Franklin cancels hometown show citing treatment". CBSNews.com. July 12, 2013. Retrieved July 12, 2013. ↑ "Aretha Franklin not attending baseball luncheon". August 19, 2013. Retrieved August 22, 2013. ↑ "Aretha Franklin Cancels September Show, Sparking Concerns Over Her Health". August 20, 2013. Retrieved August 22, 2013. ↑ "The Queen of Soul is on the mend, but from what?". USAToday.com. August 21, 2013. Retrieved August 22, 2013. ↑ Edna Gundersen, USA TODAY (2014-06-12). "Aretha Franklin happily sheds weight, embraces future". Usatoday.com. Retrieved 2014-08-02. ↑ Bego 2010, p. 238. ↑ Ebony 1995, p. 29. ↑ Grammy Awards tribute to Aretha Franklin Franklin has been cited as a major influence of singers such as Jennifer Hudson, Jill Scott, and many others. ↑ The Billboard Hot 100 All-Time Top Artists. Billboard.com. Retrieved on July 8, 2011. Archived January 16, 2013, at the Wayback Machine. ↑ "100 Greatest Artists: Aretha Franklin". Rolling Stone. April 20, 2011. Retrieved May 23, 2013. ↑ Dobkin, Matt (2006). I Never Loved A Man The Way I Love You: Aretha Franklin, Respect, and the Making Of A Soul Music Masterpiece. New York: St. Martin's Griffin. ISBN 0-312-31828-6. ↑ Bego, Mark (1989). Aretha Franklin: The Queen Of Soul. New York: St.Martin's Press. p. 108. ISBN 978-0-7090-4053-8. ↑ "Minor Planet Center". Retrieved 7 April 2015. ↑ Obama quoted in David Remnick, "Soul Survivor: The revival and hidden treasure of Aretha Franklin." The New Yorker, April 4, 2016. Retrieved on April 4, 2016. ↑ "Harvard Honorary Degrees". Retrieved 2014-07-20. ↑ Yesha Callahan (May 29, 2014). "Aretha Franklin Receives Honorary Degree From Harvard University - The Root". The Root. Retrieved October 4, 2014. Wikimedia Commons has media related to Aretha Franklin.